Eliminate White Line Disease in Horses' Hooves Once and For All! 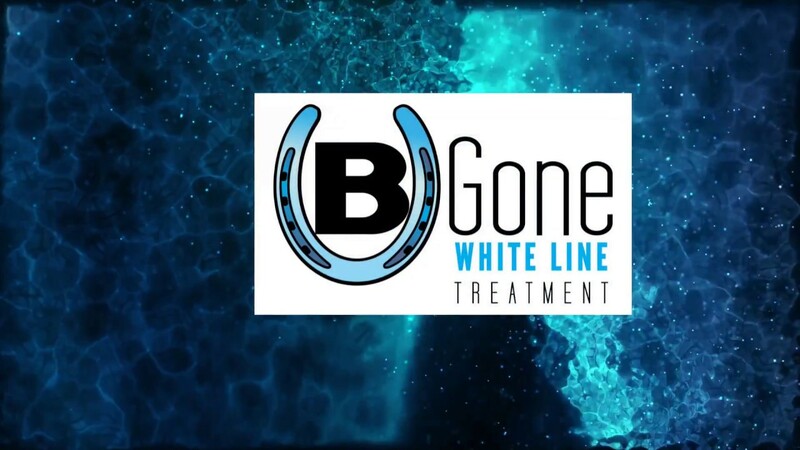 B Gone White Line Treatment is the only solution endorsed by professional farriers to stop white line disease (WLD) in its tracks. B Gone White Line Treatment is easy-to-use and effective because it’s applied directly to the infected hoof area using a convenient 60cc syringe. Its patent-pending blend of proprietary ingredients is the only product that halts equine white line disease, even on stubborn, long-term white line cases. It’s affordable and really works! What is White Line Disease? White line disease “eats away” and deteriorates the inner section of the hoof wall causing hoof wall separation. Because the hoof wall supports most of the horses’ weight, any structural weakening in the hoof can cause lameness, even leading to laminitis or founder, a potentially crippling condition. White line disease can initially appear as a small spot where the sole of the foot meets the white line. For more developed cases, it can be several inches long going from one side of the hoof to the other. It has a white, powdery look to it. Scraping it with a nail produces a chalky residue. Continued scraping can find holes and cavities running parallel with the inside hoof wall way up towards the coronet band. Read more about frequently asked questions on white line disease. Where Is the White Line Area in the Horses’ Hoof? The white line is the thin, “whitish” area between the outside hoof wall and where it meets the sole. It can be seen by picking up the foot looking at the sole of the hoof without the shoe, around an 1/8” thickness. To farriers, it’s the area nails are driven to hold a shoe on. How Does a Horse Get White Line Disease? Fungi or bacteria invade the white line within the hoof wall (laminae) causing it to break down. If left untreated, white line infection is a potentially devastating disease that can spread rapidly around the hoof, inside the hoof wall, making the horse extremely lame. It can spread to other healthy feet quickly. What Causes White Line Disease? Equine researchers do not know why one horse is prone to white line disease in the same barn in the exact conditions while other horses are not. In fact, researchers are not able to transfer the disease from an infected horse. Barn hygiene or muddy conditions do not appear to be a factor in a horse developing WLD infection. B Gone White Line Treatment is revolutionizing how to effectively treat white line disease once and for all. B Gone is applied exactly where it’s needed to target the affected hoof wall area using a convenient 60cc syringe. Simple as that! Read more about applying B Gone White Treatment to beat white line disease in horses. Existing topical treatments using caustic chemicals (such as iodine, bleach or chlorine dioxide solutions) can potentially do more harm than good to live tissue, not to mention the expense, odor and hassle of cumbersome “boot soaking” regiments. Not anymore! your only line of defense. Up to now, farriers and veterinarians struggled to find an effective treatment that does not involve major hoof wall resections (cutting away diseased hoof/healthy tissue) on a foot that shows even a touch of this highly invasive and potentially crippling disease. Now, treat with B Gone first, and pair with resections for only the worst cases. B Gone White Line Treatment can make your life much easier, and your horses too, when it comes to treating WLD. Finally, a solution that really works! We live in a wet region and have been battling white line disease in my 3 horses for years trying almost every product on the market with disappointing results. With B gone we saw improvement with the first application. After 4 months the white line is GONE! My farrier is truly impressed and recommending this product to other customers. Best product out there. LOVE this product. Effective and easy to use. Saw a huge difference within one 5 week trimming cycle, and my guy's feet just keep getting better. I'm planning to always have a tube on hand. B Gone White Line has helped two horses at our non-profit ranch get over their white line disease in such a short time compared to other treatments! It’s all we use now and our farrier is also now a believer! Great product, effective and easy to use. I recommend it to all my clients with white line or seedy toe issues. I bought my horse Zinger 6 years ago. On his first farrier appointment we discovered a significant case of White Line. After 6 long years of trying every product on the market combating this nasty disease, hoof resection from my saint of a farrier, etc. I saw an advertisement for B-Gone. I figured what the heck, let’s try yet another product. Tim came and did a trim and dug some of the funk out as usual and then we applied the BGone. I’ve been putting I. zingers hoof weekly. Tim came today for Zingers trim and we are stunned. This stuff works! The White Line is almost all cleared up...just one very small section that will get a weekly application. I can’t wait for the next 8 weeks and get that long awaited news “The WLD is gone!” Thank you for a brilliant product! I had purchased an 11-year old Appendix as a school horse and come to find he had white line disease in all four feet. My treating vet straight up told me to just get rid of him. After beginning treatment with BGone White Line Treatment, the disease stopped its progression. He now has a solid hoof wall on all four feet and I didn’t have to go through expensive or tedious treatments! B Gone worked in just one application on my adopted Arab gelding. I had tried all sorts of treatments on another gelding, but none ever worked very well. And nothing like the results we just got. I highly recommend B Gone. Love this product! I've been using it as directed and seen excellent results! Finally, something that works, is affordable and easy to use. Best treatment I've used for white line in 2 of my horses. once a week treatment was amazing. Use it on my horses which habitually have white line/cracks and it works better than any other product. Thank you! This is an excellent product! I really recommend it. “It’s never failed. Works first time, every time. It’s easy to use. We’ve tried everything that they say works – and it never works. But this stuff works! You won’t be disappointed. I treated 3 horses with white line and all 3 cases were healed by the next shoeing. I like that it's very simple to use and made from ingredients that won't harm live tissue. You may be onto something! I used it for the first time on a horse that had to be sedated for shoes. He had white line disease in three feet with 20-30% separation. As soon as we started treating with BGone, the progression stopped and we were able to grow out a healthy foot and keep this horse barefoot. I’ve used it in many stubborn toe cracks I could not get rid of and six weeks later, those toe cracks had grown out and the white line had closed up. It just works. I have struggled with white line on my Quarab for YEARS.... so badly that the ferrier didn't have anything left to nail a shoe to! I finally just decided to keep the horse barefoot and try different treatments so as not to lock the bacteria in again. I thought I would give B Gone a try after doing research and reading the reviews and guess what IT REALLY WORKS!!!! I live in East Tennessee and we have really wet conditions during different seasons of the year and I will definitely keep this handy at the first sign of any white line!!! You can place an online order for B Gone White Line Treatment directly from our distributor, Georgia Farrier Supply, for $26 (plus S&T) for a 60cc tube that can be reused for multiple treatments. All credit cards and PayPal accepted. B Gone may be available at your local feed or tack store. Farriers ask for it at your farrier supply house. We have a growing list of locations for you to buy B Gone White Line Treatment here on our website. If your favorite store is not on the list, call us and we will talk with them about carrying the best treatment for white line disease. B Gone White Line treatment is available coast-to-coast and also online on Amazon.com and at Heartland Veterinary Supply and Pharmacy.